mexican | Gluten Free? Gimme Three! I was visiting a friend in Florida recently, and had one of the more unique meals I’ve ever eaten: Thai-Mexican fusion from Nitally’s in St. Pete. They mix Thai curry with Mexican mole, use chipotle in stir fried rice, and put cilantro on everything. 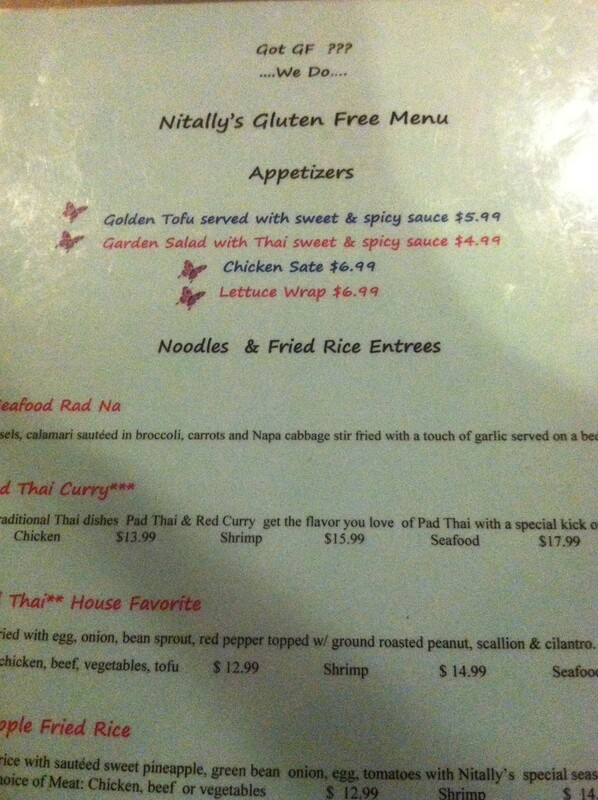 They have a dedicated gluten free menu, which was great since I’m always wary of lurking soy sauce or fillers in curries and Asian food. 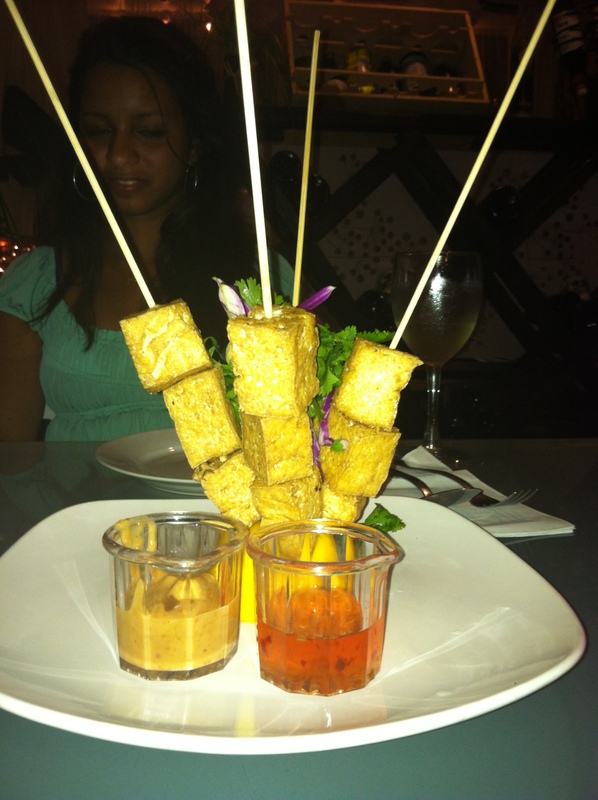 We started with the tofu appetizer, which came with peanut and sweet and sour sauce for dipping and fresh cilantro. 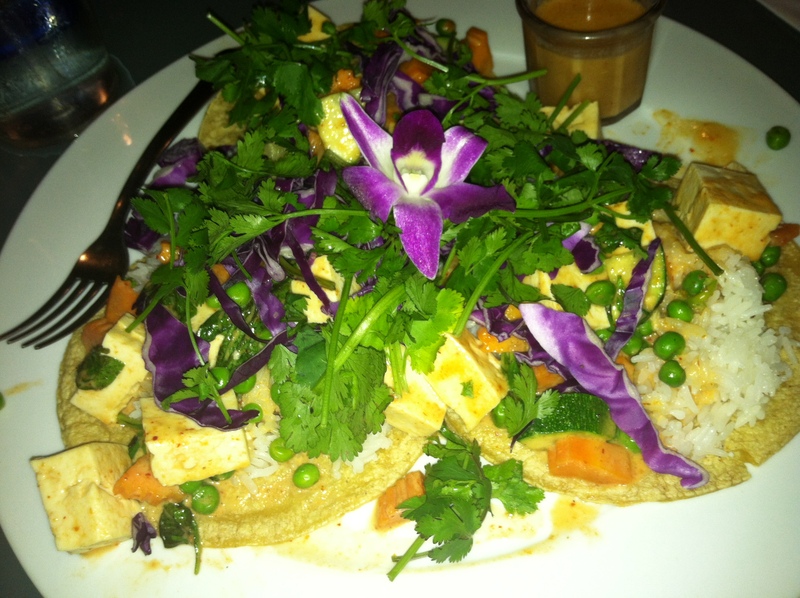 For an entree I had red curry tofu tacos, which seemed odd, but were crazy good. There was a ton of fresh cilantro on top, which I love. The corn tortilla/rice/curry sauce combination was unexpectedly addictive, and I ended up eating way more of the huge portion than I anticipated. I think next time I get Thai food take out I’m going to just dump it on a bunch of tortillas. It’s a whole new way to eat it with no chopsticks required! Last night Pachanga Patterson was packed! It’s rare to have to wait for a table on a Thursday night in Astoria, but that is what spectacular Mexican food will do for a neighborhood! I wouldn’t even call it Mexican food, really, it’s more like “new-Mexican”, or just don’t put a label on it and stuff it in your mouth instead. The first time I went to Pachanga I got the mushroom tacos, which don’t sound like they would make you jump for joy, but they were the best non-fish, non-meat tacos I’ve ever had. They must have a miracle marinade for the mushrooms, because they were super flavorful. But this time, I ordered the Veggie Jenga. At first I thought that Jenga was a word in Spanish that I didn’t learn in high school, but then the waitress explained to me that it’s called that because it’s layered and stacked up just like the block game. This creation is out of this world. It’s one of those anytime meals that makes you eat way more than you anticipated. When they first put it down in front of me I thought, “There’s no way I can eat all of this.” Then 20 minutes later I was virtually licking my plate. The picture above is from We Heart Astoria, since I forgot to bring my camera, but the plate that I got was piled a couple of inches higher with lettuce/cabbage. I loved the sweet potato puree, which you don’t usually find in Mexican food. I loved the avocado sauce. I loved the generous crack of black pepper on top. I loved the crispy corn tortilla from Tortilleria Nixtamal. I loved the mild hot sauce that they put in a honey bear container. Love, love, loved. I also loved the $6 glass of Torrontes wine that I washed it down with. 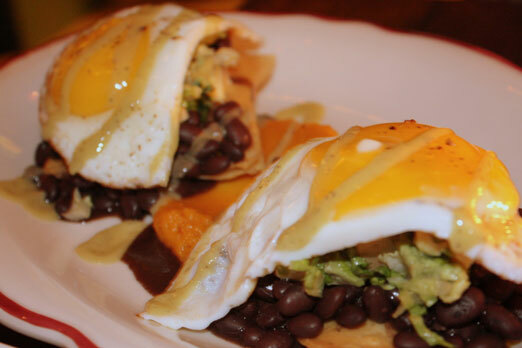 Soon they will have brunch at Pachanga, where I can have this as my new favorite hangover food.